Anyone can correct me or ignore me or add alarm to this. Feel free. I support all families that have more strict rules than we do. We have had an x-box for a few years, though I DO “get rid” of it from time to time. We also have had a Wii and Game Cube and PS2 over the years. Though it has parental controls and family preferences that can be set, the players are bombarded with advertisements constantly. The way to get rid of that is to not hook it up to the internet, which is what we have now. The internet is necessary to download new games, the boys have had the net on for this reason more than I would have liked, but that is in the past… or to play with people on the internet, which we don’t like. The x-box has some good games that are multi-player and allow the kids to progress through levels (which my boys like). 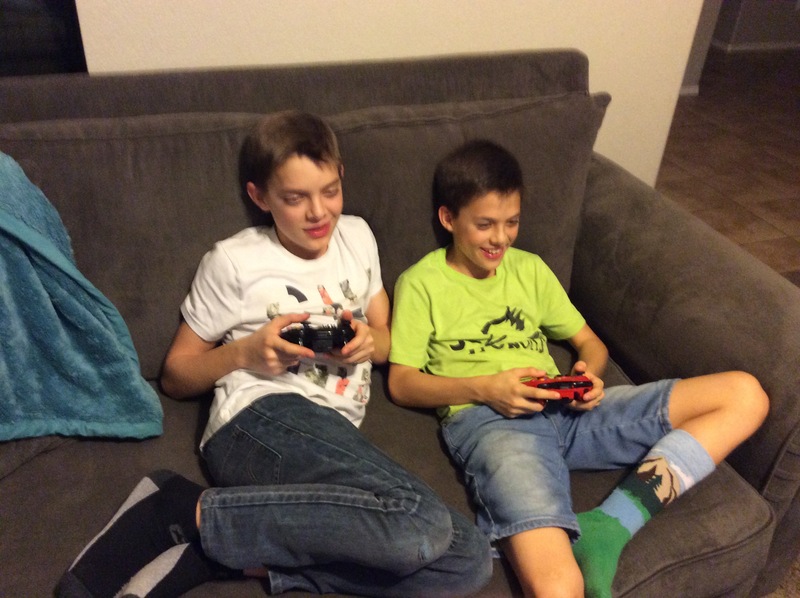 They have liked “Skate 3” (with all the blood and sound off) “Terraria” “Lord of the Rings Conquest (which is questionable in my mind, but I have let them play it because they are not fighting humans nor holding guns. )” It seems to me that x-box has the most awful games of any console, so the advertisements were more than I could handle. I have been mad at the x-box so many times because of the “home” screen. The kids favorite games have been Zelda and those are all available on Wii-U. We haven’t had a Wii-U, but J.D. won a Switch recently and the kids pitched in to get a Zelda game and have loved it. Zelda is excellent, in my opinion. Right now after the last day of school, Adam and Curt are playing “Terraria” together. – E, E-10+ and maybe some T if they follow the above rules, are controlled and approved by Mom. NEVER M, of course. No Call of Duty! No Fort Night or League of Legends (both too addictive). – Only games on Friday and Saturday after all responsibilities are done, with Mom or Dad’s permission. – Limited hours on summer days. So, those are the basics. Does anyone have suggestions for me or more clear information? Good luck! Believe me, you’ll need it. Remember, you are the parent, which means you are in charge. Be a COURAGEOUS PARENT. Thank you for this advice! We are buying Zelda for Wii-U this very week because of your ideas. We have a Wii-U and were worried that because it was “outdated” we would have to buy a new game console and therefore learn all new tricks and protections, etc. So I am able to surprise my kids by freshening up their Wii-U experience just in time for summer (with time limits, of course!). The Wii-U has lots of protections I already like, so this is better all around. And I love all of your rules, as well. So very helpful. Thank you! Video games! Ugh! I am so sick of the subject, but it must happen. How do your kids like Zelda?